Kids love toys and it’s always fun to watch them play. Simple, fun and easy toys are the best, so Whacky Shots World Warriors Power Pack covers it all. 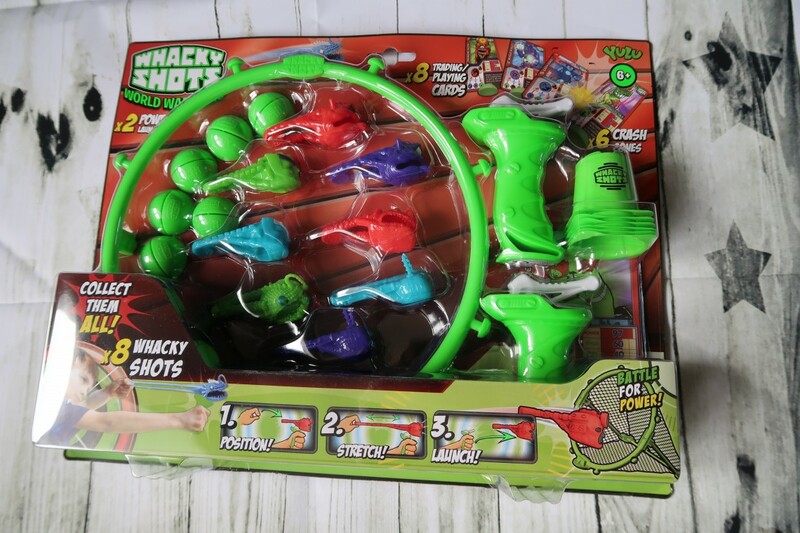 Whack shots are collectable rubber toys, that kids can use a slingshots style aims to win the game. 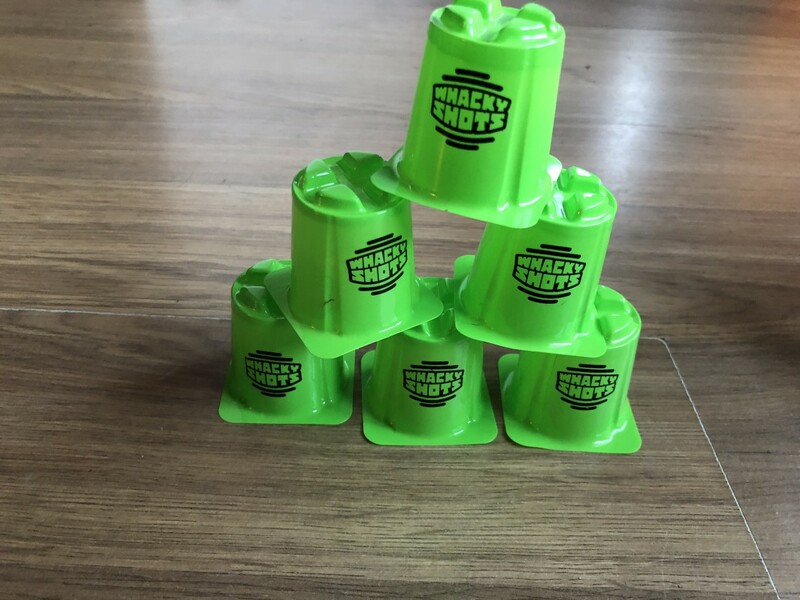 There are lots of different games you can play with Whacky shots power shots. You can play on your own or in teams. Not only is there the fun game of winning and losing, but there is also trading cards to collect and different figures to save. 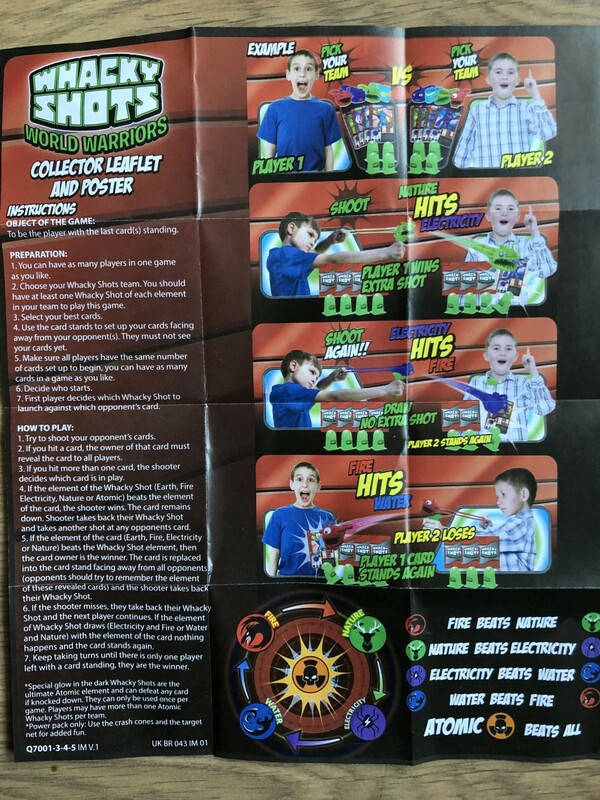 The Whacky Shots World Warriors Power Pack comes with 8 Whacky Shots, 2 Power Launchers, 6 Crash Comes, 8 Trading Cards, 8 Bases, 1 Net and Instructions. The whacky shots can far, so make sure you have plenty of room. They look like funny little creatures, don’t they? They are rubbery and bend, but look great and kids loved them. The bright colours are a huge attraction. 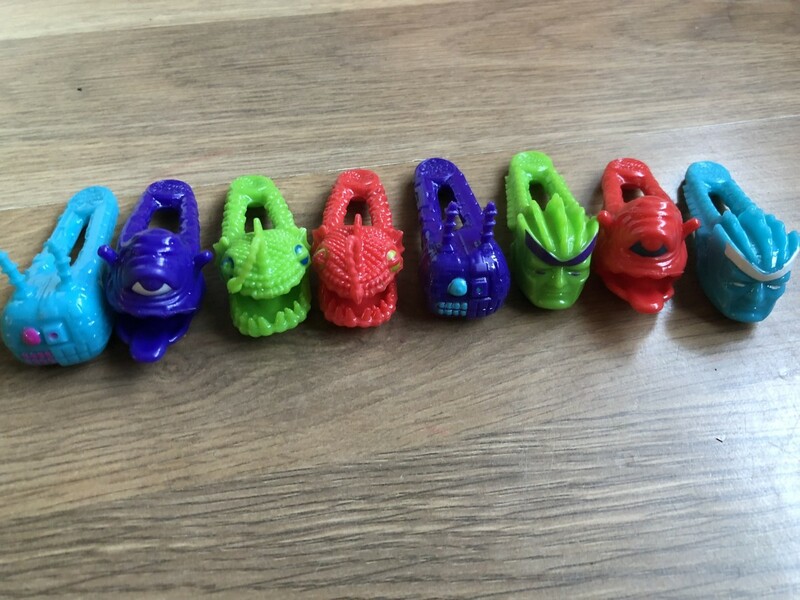 There are a total of 60 different ones to collect in series 1 alone, which fall into 4 teams; Invading Aliens, Mutant Beasts, Rogue Robots and Earth Heroes. The colour of each Whacky Shot determines what collection they are with and they go into a pack a bit like rock, paper scissors. So fire beats nature, nature beats electricity, electricity beats water, water beats fire and the atomic ones beat all the others. It’s a little tricky at first to get the Whacky Shot to fly across the room on the launcher, but it doesn’t take long to master. Once you’ve mastered it, get flinging your Whacky Shots into the net, hit the cone and cards to win. There is also a circular target on the back of the leaflet too. Get practising and you can get those Whacky Shots to win too. Here are the Whacky Shots cones, are a lot of fun to knock over. It isn’t easy but with practice, they will soon be getting knocked over. Ready, aim and fire! 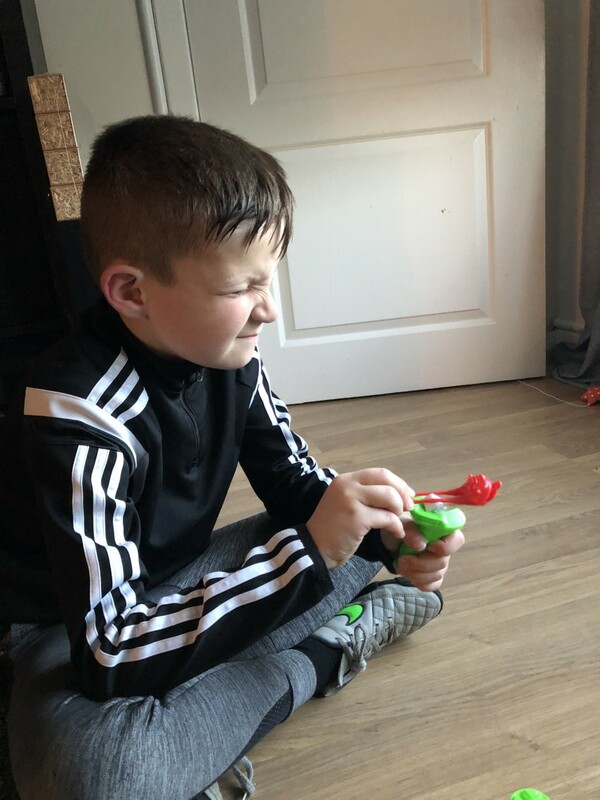 Got to get the concentration face on! Place the Whacky Shot on the launcher, pull it back and ping, off it goes. 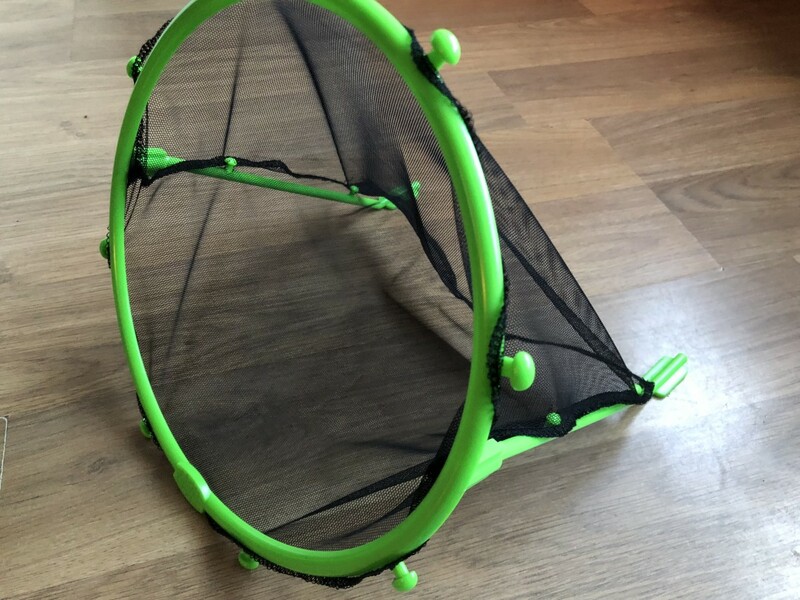 The net is little tricky to setup, but there is a hole in it that fits over the hooks. It’s not easy to see, but they are they are they work. 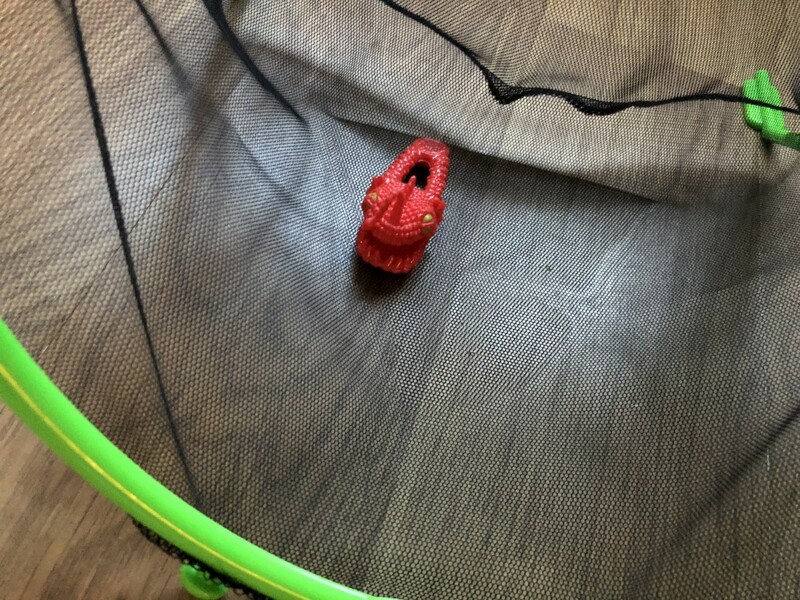 Now time to aim the Whacky Shots into the net. And score. 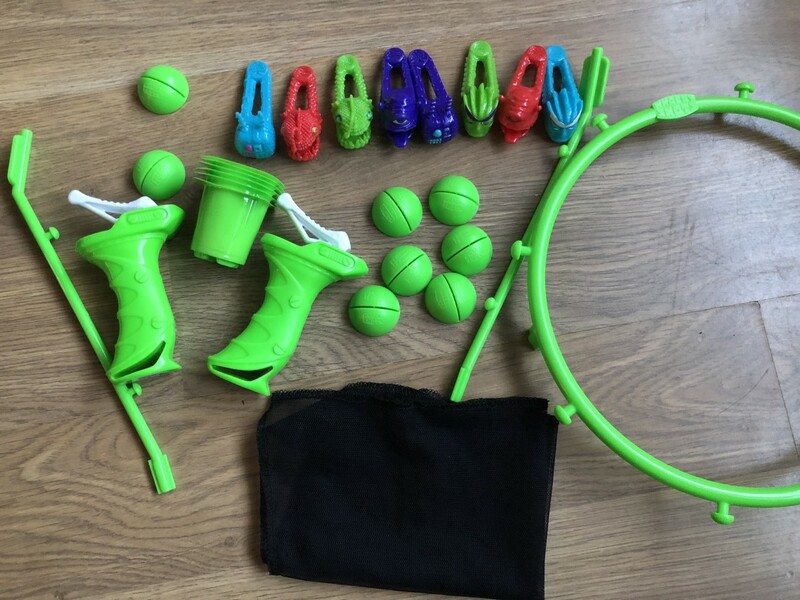 There are so many ways to play, plus you don’t need to use any of the parts to shoot. You can just use the trigger and the Whacky Shots to play and have fun. 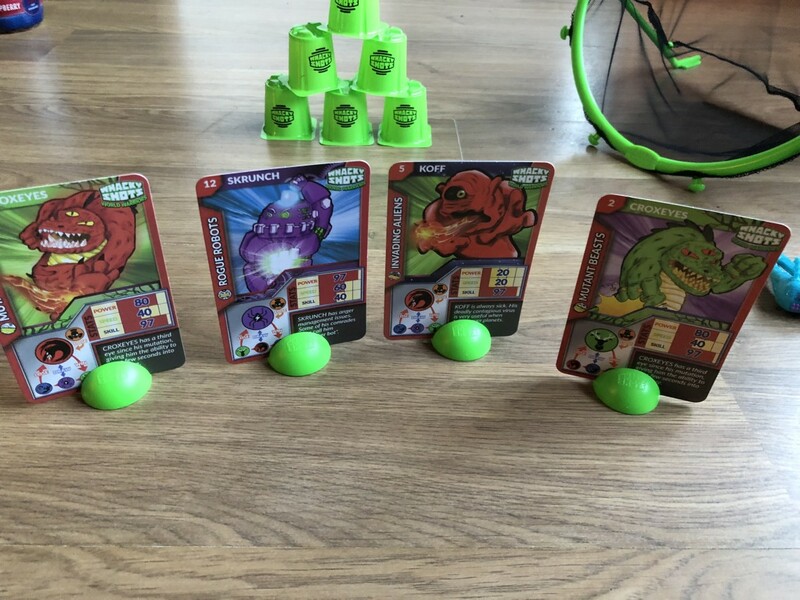 The cards take it to a whole new level and add some extra fun, whether it’s knocking them over or collecting or mixing up the game. The stands make it a lot more fun and practising your target shots. Can you knock them over? Whacky Shots World Warriors Power Pack is so many games in one. It is versus game, a game of aim and competition fun. 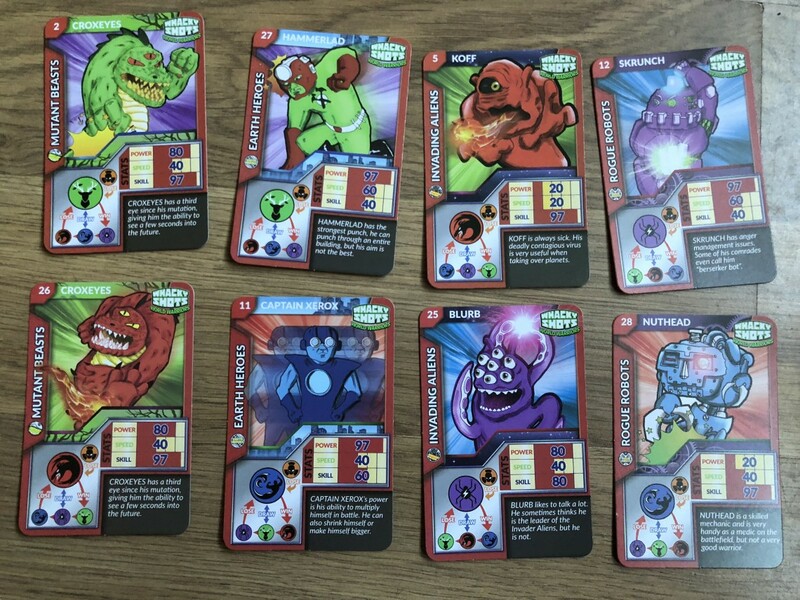 There are lots of different things to do, lots of ways to play and the trading cards add a new level. We had a lot of fun playing this and the boys especially enjoyed it. Little Miss was a little young at 5 and couldn’t get them to fly. The game itself is aimed at 6 plus and I think that is a good age range. 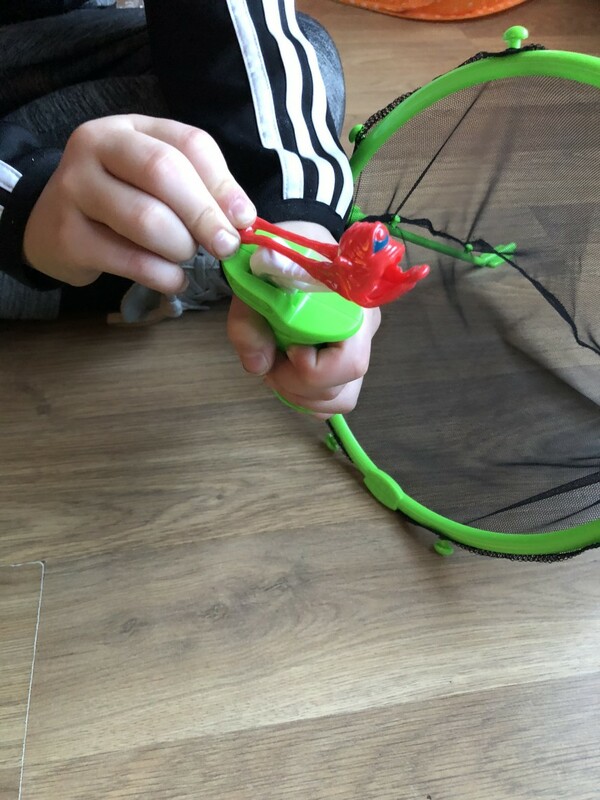 Older kids will love the look as it’s not babyish, but the colours bring it to life and boys love those slimy, rubber monster Whacky Shots. A great little set to give as a gift and a great price at £14.99. And £5.99 for single packs. 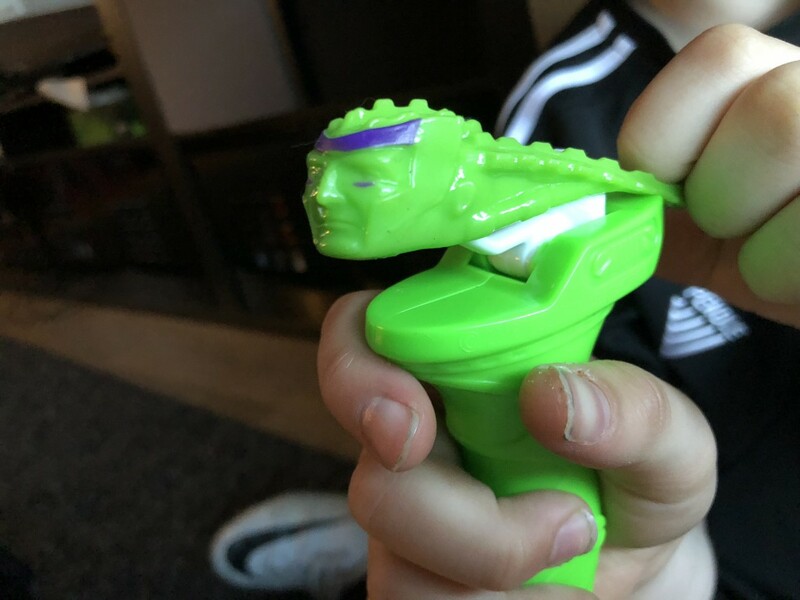 You can buy Whacky Shots World Warriors Power Pack (Affiliate Link) and give it a go. It’s great to take on the go or place inside on rainy days to keep all keeps occupied. Disclaimer:- We were sent the Whacky Shots for review, but all thoughts and opinions are my own.